A few years ago when I was really getting serious about woodworking and building out my shop, I was mystified about router bits. Not only do they come in many different profiles, lengths, and radiuses, but most were available in 1/4″ and 1/2″ shank diameters. After using routers and just recently completing a large router project for a church display, I’ve come to the realization that my earlier predisposition to 1/2″ shank bits was totally unfounded. 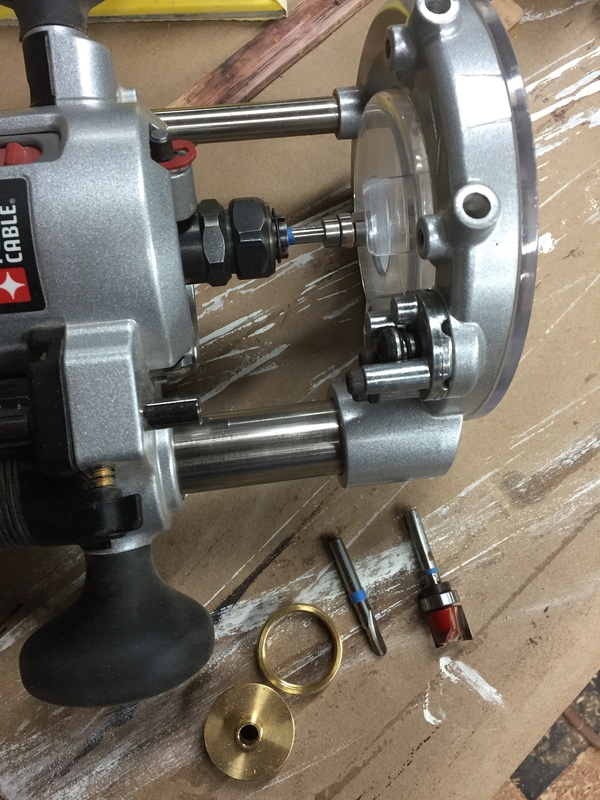 1/4″ shank bits do not vibrate, and cut just as well as half inch bits. Plus the fact that my compact router, which only has a 1/4″ capability can be used with all these bits. 1/2″ shank bits do have their place. Primarily in routing large dimension boards and production work. But for my shop, which is not a full-time endeavor, that is not a consideration. Don’t get me wrong, I do have a number of 1/2″ shank bits which I bought early on. I do not regret those purchases because my main router, a Porter Cable 890 and my router table both have 1/2″ shank capability. Plus, some profiles are only available with 1/2″ shanks. Another advantage of standardizing on a single shank dimension, is that you often are cutting several profiles with the same router and you are constantly switching bits, as in the project below. Changing collets each time is a real pain, and I refuse to do that. Column has 3 different profiles cut with 3 different bits. Now I see why many woodworkers have multiple routers, which allows you to have a router available for each set up. I plan to do that. In conclusion, now when I go looking for a router bit I look for 1/4″ shank bits first, and 1/2″ shank bits second. Opposite of what I used to do. I was wrong, and happy about it.